24 Hour Emergency Service from Flue Steam Inc. Kitchen exhaust systems are incredibly important for maintaining the safety and comfort of your commercial kitchen. Maintain yours correctly and you’ll never have to worry about a dangerous situation – such as a flash fire – arising. 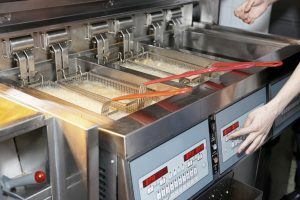 Not only are flash fires inconvenient because they force you to shut down operations for awhile, they also could cause serious injury to your kitchen staff. That’s why California law insists that kitchen exhaust systems be regularly cleaned and properly maintained. But if an emergency situation does happen to arise in your commercial kitchen, you need assistance ASAP to avoid a dangerous and costly situation. If you don’t get your kitchen exhaust system back to perfect working order before cooking again, you risk getting heavily fined by government officials. You know that saying, right? Now apply it to your commercial kitchen exhaust system by scheduling regular cleaning services with Flue Steam. Our regular kitchen exhaust system are typically booked at least one week in advance, but we can accommodate your busy schedule when determining an ideal date and time for your exhaust system cleaning service. Set up a regular cleaning schedule and you won’t have to worry about an emergency need arising with your kitchen exhaust system ever again because at every cleaning appointment, our knowledgeable technicians will grease your fan bearings, check the belts, and replace worn belts with new, customer-supplied ones whenever needed, at no additional charge. We offer these complimentary services because it’s our mission here at Flue Steam to meet and often exceed your expectations. We’re always asking, “what can we do to help you?” We’re looking forward to making sure your commercial kitchen is safe and perfectly satisfied government regulations very soon. Flue Steam has been the leader in commercial kitchen air control and fire prevention in Southern California for over 48 years. We look forward to partnering with you for many years to come. Call us at 800-700-FLUE to ask any questions you may have about our services and schedule an appointment today!